Home Online Is the Emirates Instagram promotion real? 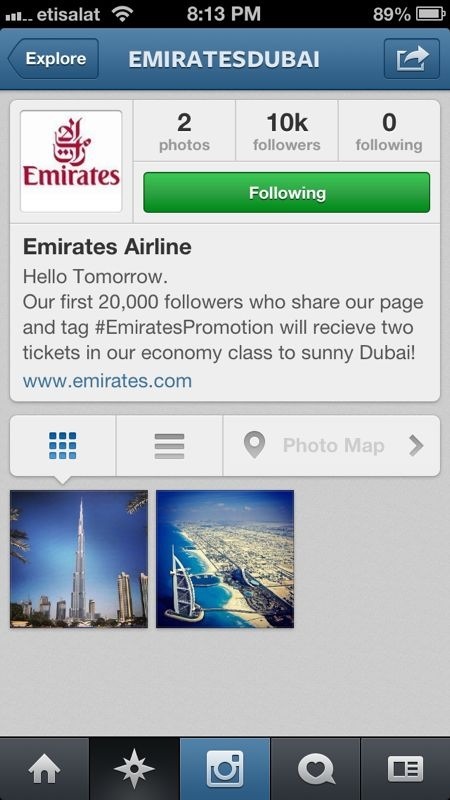 January 30, 2013 Online, Social Media	Comments Off on Is the Emirates Instagram promotion real? Ok I didn’t plan to talk about more airline news following yesterday’s rant about Etihad Airways but images and screenshots are flying around on social networks about Emirate’s new promotion on instagram. That is insane! Emirates want to give away 40,000 free tickets to dubai?! It doesn’t sound right, does it? Just for sharing and tagging with #EmiratesPromotion a user can win two tickets? As of today the user Emirates Dubai has over 13K followers. I did find a number of pages for Emirates Airlines, but I’m not sure which one is the official page. I’m calling this offer a hoax although I don’t see why anyone would go through all this trouble to promote an airline, and what they would gain from such a stunt, so to be sure I contacted Emirates Airlines and I’m waiting for some confirmation which will be posted as soon as its received. What do you think, is this a real promotion or just somebody trying to pull a fast one? Let us know your thoughts below. Signup to receive our newsletter or get in touch for a free consultation.